President Donald Trump's commission on combating drug addiction and the opioid crisis released its final report on Wednesday, calling for the Department of Justice to set up nationwide drug courts, a national media campaign and expanded educational programs, as well as reimbursement for a broader range of non-opioid pain medications and treatment services. 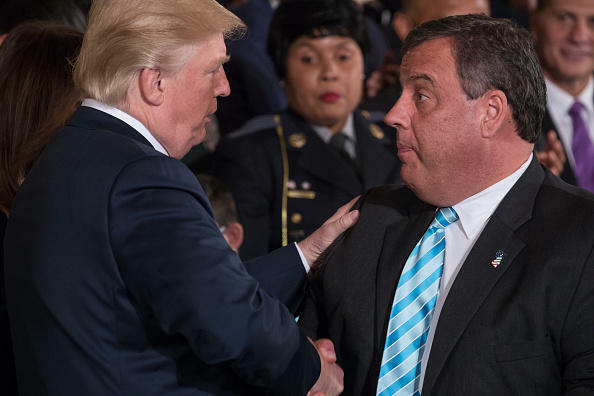 The 128-page report outlines over 50 different proposals made by the commission, chaired by New Jersey Governor Chris Christie, to curb the opioid epidemic. The commission recommends establishing drug courts in 93 federal judicial districts, calling them "a proven avenue for treatment for individuals who commit non violent crimes because of the substance abuse disorder." The commission believes drug courts are more effective than prison sentences for treating substance abuse, according to the report. Other recommendations include expanded access and administration of Nalaxone, the drug overdose reversal medication, "enhanced" federal sentencing for fentanyl traffickers, and an overall push to eliminate the societal stigma that creates a barrier for those seeking treatment. An event on Wednesday afternoon at the White House, where members of the White House commission voted to approve of the final report, featured powerful stories of individuals in recovery and painful and heart-wrenching personal testimonies of parents who have lost a child to an opioid overdose. "Our daughter begged for treatment and told us repeatedly she couldn't live this way," Doug Griffin, who lost his daughter Courtney to a heroin overdose in 2014, told the commission through tears. "Our insurance company denied her at every door. The pills she found so easily at school led to heroin and the destruction of her life." Christie offered an assurance to parents that their children's deaths were the result of the government's failure to reckon with addiction. "We need to make sure that those folks responsible for the care and treatment of our people, the medical community, the insurance community, understand that these two co-exist and that from your testimony, the reason for your son's passing was not his addiction," Christie said. "The reason for his passing was our inability to deal with his addiction and his mental health issues. So it's a powerful, powerful reminder of why we continue to say that addiction is a disease and that there should not be stigma attached to it." The commission's report comes a week after President Trump declared the opioid crisis a national public health emergency. The directive expanded medical services to states grappling with the largest public health crisis in American history but failed to funnel any additional funding towards fighting the epidemic. Christie addressed those criticisms head on before concluding the White House event. "I asked someone the other day who was talking to me about funding, I asked him, 'If a terrorist organization was killing 175 Americans a day on American soil, what would you be willing to pay today to make it stop?' I think we'd be willing to do everything and anything to make it stop," Christie posited, calling on Congress to step up to appropriate funds to combat the crisis. But Christie added that "just spending money won't be enough if we aren't spending it in a way that's evidence-based." Former Rhode Island congressman Patrick Kennedy, a member of the commission, told CBS News after the event that he had hoped the report would have "made a strong play for insurance coverage for all" but that the commission was limited by the confines of the president's policies. The Trump administration supported a health care bill to replace the Affordable Care Act put forward by Senate Republicans over the summer that would have made deep cuts to Medicaid. "Governor Christie appreciates what Medicaid expansion has meant to New Jersey," Kennedy said. "He wouldn't be able to do what he's doing as governor of that state without medicaid expansion." "I think the President and Congress have to decide where their priorities are and this is a moment in time that is now going to be emblazoned in the public consciousness after the President spoke so starkly about this issue — either you're going to be real or it's going to be lip service," Kennedy added. Kennedy said that despite the report's shortcomings, he was was very heartened by the emphasis on Enforcing the Mental Health Parity and Addiction Equity Act during the event on Wednesday. Co-authored by the former Congressman and passed in 2008, the act aims to ensure that individuals with mental illness and substance abused disorders aren't discriminated against by health insurers. The commission's final report urges Congress to increase the authority of Labor Secretary Alexander Acosta to investigate and penalize insurance companies for parity violations.